Khazanah Nasional Bhd is launching a prestigious project, estimated to be worth over S$7 billion (RM17.19 billion), at Marina South in Singapore by the end of this year or early 2013. The yet-to-be-named mixed-use integrated project will be developed by M+S Pte Ltd (MSPL),which is 60 per cent-owned by Khazanah, the government’s investment arm, and 40 per cent by Singapore’s investment arm Temasek Holdings (Private) Ltd. The project will feature four prominent residential and office towers, as well as a retail podium, and linked to the Marina and Downtown MRT lines, MSPL chairman Datuk Azman Yahya told Business Times. MSPL had secured funding for the project with eight banks in March. 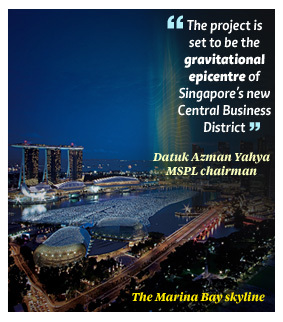 Azman said that the project, which is designed by Germany-based Ingenhoven Architects, is set to be the gravitational epicentre of Singapore’s new Central Business District. This is the second development for MSPL in Singapore. The company is developing land parcels at Ophir-Rochor, which is estimated to have a gross development value exceeding S$4 billion (RM9.82 billion). The two projects are expected to be completed over the next six years. The project managers for both the Marina South and Ophir-Rochor developments are indirect wholly-owned subsidiaries of UEM Land Holdings Bhd, which is the real estate arm of Khazanah, and Singapore’s Mapletree Investments Pte Ltd and CapitaLand Ltd.
At the recent Asia Pacific Property Awards 2012, the project at Marina South, which will be Green Mark Platinum-rated, won three national awards – high-rise architecture, mixed-use architecture and mixed-use development. heart of Marina South which sets the standard for international excellence in design and sustainability for integrated living. “This area has been identified by the Urban Redevelopment Authority as a growth area of Singapore in establishing a global business and financial hub,” said Azman in an interview. The project’s eminent neighbours will include Marina Bay Sands, Singapore Flyer, Esplanade Theatres on the Bay and the upcoming Gardens by the Bay. Posco will take not more than 20 per cent stake in the development of Berjaya Jeju Resort on a 73.2ha site in Yeraedong in Seogwipo City, southwest of Jeju island. BERJAYA Land Bhd (BLand), a property and gaming company, is close to inking a partnership agreement with South Korean steelmaker Posco Group on the acquisition of up to 20 per cent in the former's US$3 billion (RM9 billion) project in South Korea. 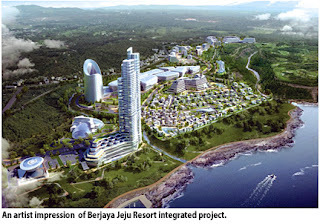 BLand is developing Berjaya Jeju Resort through its subsidiary, Berjaya Jeju Resort Ltd (BJR), on a 73.2ha site in Yeraedong in Seogwipo City, southwest of Jeju island. BJR director Tan u-Jiun told Business Times in an interview that it expects to seal the deal with Posco by August or September this year. "Posco will take not more than 20 per cent stake in the development and they will help to develop it," Tan said. Posco, which is listed in Seoul, Tokyo, London and New York, is involved in railway development, construction of buildings and infrastructure and steel manufacturing. This will be the first partnership for Posco in Malaysia and the agreement with BLand is via its unit, Posco Engineering & Construction Co Ltd.
Tan, the younger son of Berjaya group founder Tan Sri Vincent Tan, said the first phase of the project comprising 212 units of luxury villas and market place is slated to be launched by the end of this year or early next year. "We are awaiting the final approval for the Environmental Impact Assessment on our revised masterplan. We expect it to complete in May," Tan said. The integrated project will have 1,403 condominium units, villas and bungalows, 935 hotel rooms, a one million sq ft retail mall that will be the largest in Jeju, a medical facility and a market place which will comprise super luxury shops and single-storey residences. The landmark tower will be a 45-storey hotel, which will be the tallest building on the island. Complementing that is a 505-room casino hotel, which will be South Korea's largest casino complex, Tan said. "We are launching the villas and market place first to attract higher paying customers to the development. Once the market is guaranteed and it creates an aspirational image, we will release the medium-tier properties," he said. Tan said BJR hopes to start constructing the villas and market place by August this year. According to him, BLand has invested close to US$150 million (RM450 million) on infrastructure works for the project, which was completed in December last year. The project will take five to six years to develop. "We are targeting the Koreans and Europeans. We don't think the European market will be strong because of the eurozone debt crisis but we expect same sales there. We are also targeting China and Japan," Tan said. Berjaya Jeju Resort recently won an award in the category of mixed- used development for South Korea at the Asia Pacific Property Awards 2012. KUALA LUMPUR: Asia's first Legoland theme park, dedicated to the popular toy bricks, is set to open for business on September 15 this year. 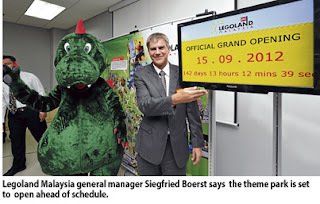 "I am pleased to announce that due to the hardwork of all our contractors, we will be opening the park ahead of schedule by a number of months," Legoland Malaysia general manager Siegfried Boerst said. In a statement, he said the park is already 75 per cent complete, with most of the rides and infrastructure in place. Next month, contractors will begin to install the Lego models made out of more than 50 million bricks. To date, more than 35,000 annual passes had already been sold for the park that features more than 40 roller coasters, race cars and other attractions. Legoland Malaysia is the sixth Legoland theme park in the world and the first of its kind to be opened in Asia. of the rights issue for the trust in July this year, said its chief executive officer, Lim Yoon Peng. Unitholders of AmFIRST REIT today unanimously approved the proposed renounceable rights issue and a proposed increase in fund size at the unitholders' meeting here today. Lim said based on an illustrative rights issue price of 85 sen per unit, the proposed rights issue is expected to raise gross proceeds of about RM218.79 million. Of that amount, a total of RM214.74 million will be utilised to pare down the fund's existing borrowings which stood at RM550 million as at its financial year (FY) ended March 31, 2012. "This will reduce the leverage ratio and provide the trust with sufficient headroom to gear up in future and respond immediately to potential yield accretive and strategic acquisitions," Lim told a press conference. He said he is looking at office buildings with high capital appreciation potential at strategic locations in the Klang Valley. "We will focus on commercial offices which are at full occupancy or close to it," he added. He also expects AmFIRST REIT's net income for the current year to exceed the RM52.19 million recorded for the FY ended March 31, 2012. "Commercial offices Prima 9 and Prima 10 located in Cyberjaya, and acquired late last year, have accretive yields. Contribution from these properties were recognised only into the four months of the last financial year. "Going forward, these properties will contribute to the whole of the current financial year," Lim said. For the financial year ended March 31, 2012, AmFIRST REIT recorded an after-tax realised profit of RM39.9 million, up 10.6 per cent from the RM36 million in the preceding year. Its asset under management (AUM)registered growth of 15.2 per cent to RM1.18 billion, primarily via new acquisitions of Prima 9 and Prima 10, while net asset value rose from 141.25 sen to 144 sen per unit. The trust has proposed a final income distribution of 4.83 sen per unit for the six-month period from October 1, 2011 to March 31, 2012. KUALA LUMPUR: AmFIRST Real Estate Investment Trust has received its unitholders' approval for the proposed renouncable rights issue and a proposed increase in fund size at its EGM on Monday. "The rights proposal will enable AmFIRST REIT to have a stronger balance sheet to grow its assets under management, increase its market capitalisation and enhance the liquidity of AmFIRST REIT's units," its CEO Lim Yoon Peng said. To date, AmFIRST REIT owns eight commercial properties worth RM1.189bil. The REIT is managed by its managers Am ARA REIT Managers Sdn Bhd which is 70% owned by AmInvestment Group Bhd and 30% owned by ARA Asset Management (M'sia) Ltd.
AmFIRST REIT recorded an after-tax realised profit of RM39.9mil for the financial year ended March 31, 2012 which is an increase of 10% from RM36mil in the previous year.